Built in 1965, by Martinolich Shipbuilding Incorporated at Tacoma, Washington as the Sea Queen for the Pacific Tow Boat Company of Everett, Washington. In 1969, the Pacific Tow Boat Company and the Foss Launch and Tug Company of Tacoma, Washington. Were acquired as subsidiaries of the Dillingham Corporation of Honolulu, Hawaii. Operations of the two companies were united under the Foss Maritime Company. Where the tug was renamed as the Mathilda Foss. In 1987, the Foss Maritime Company was acquired as an independent subsidiary of Saltchuk Resources Incorporated of Seattle, Washington. Where the tug retained her name. In 1998, she was acquried by the Campbell Towing Company Incorporated of Wrangell, Alaska. Where the tug was renamed as the Peril Strait. 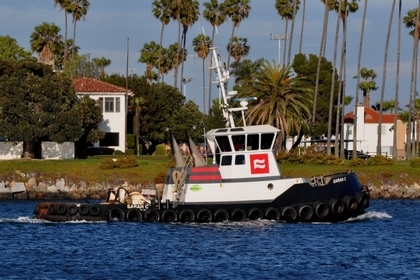 In 2006, the tug was acquired by the Seley Corporation of Ketchikan, Alaska. Where she retained her name. In 2007, she was acquired by the Curtin Maritime Corporation of Long Beach, California. Where the tug was renamed as the Sarah C.
In 2007, the tug was extensively rebuilt, receiving new bulwarks, and a new superstructure. She was re powered with a single, Tier II compliant, Cummins QSK38 diesel engine. Turning a single, stainless steel, fixed pitch propeller. With a single Thrustmaster z drive mounted forward, rated at 400 horsepower. Her electrical service is provided by two, 200kW, John Deere generator sets. The tug's capacities are 15,000 gallons of fuel, 200 gallons of lube oil, 200 gallons of hydraulic oil, and 800 gallons of water. The towing equipment consists of a single drum, Rapp Hydema towing winch. With an Open Reeve level wind. Outfitted with 1,800(ft) of 1.75(in) towing wire. Hailing Port: SAN DIEGO, CA.